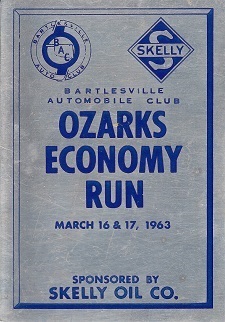 The 5th Annual Ozark Economy Run put on by the Bartlesville Auto Club March 16 & 17 was a revelation to your reporter in that a great number of people go to quite some lengths to squeeze a mile out of a drop of gas. Lean jets were used, along with 65# of air in tires; fairings were formed with masking tape around projections on the cars to reduce wind drag; rear seats, bumpers and other items were removed to lighten; vacuum gauges installed, and probably a lot of other things done that were not obvious to the eye, Evidently some of these things helped because some phenomenal (at least to us) mileages were recorded over some hairy mountainous roads at fairly high average speeds. 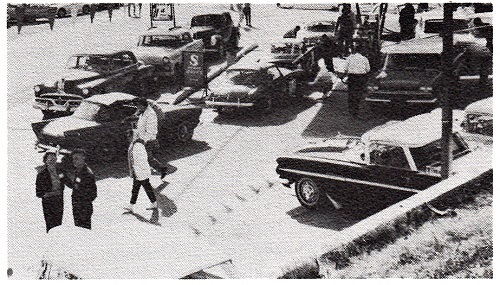 Fueling at the start: Dan and LaVerne Craig stand in the left foreground.Visible in the photo are some of the varied entries; '52 Pontiac, Checker, '40 Ford, Sunbeam Alpine, Austin Healey, TR4 and Nash Rambler. "Team England" prepares to leave Midwest City. l to r: Mike Dickey, Margaret England, George England. Rest stop at Midway point on Will Rogers Turnpike. 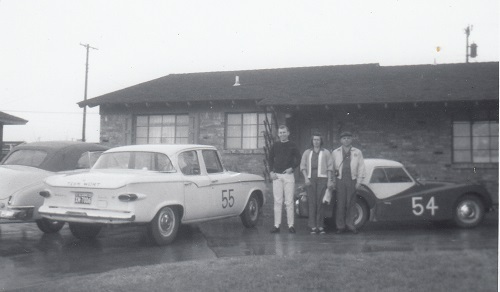 Oklahoma Region entries, l to r: TR3 of England-England, Alfa Romeo of Butler-Butler, Mercedes of Flynn-Wood, Sprite of Neimer-Miller, Studebaker Lark of England-Dickey. After everyone got shuttled back and forth between motels and finally settled into rooms Saturday evening, the 160 entrants and about 40 workers met with a punch bowl and emptied it innumerable times. We then went through a buffet style line to pile our plates with a choice of T-Bones or fried chicken. (there were 100 steaks – we were#104 in line and had that good southern chicken.) Presentation of Monte Carlo trophies followed dinner along with a trophy for the greatest distance traveled, which was taken by our own Bill Roberts. Bill had made a wide-spreading detour by way of Frederick and Lawton, where he picked up Jack Witherspoon, and, all in all, traveled 744 miles. After presentations, they pushed back the tables, brought on a combo, and twisted til the wee hours. All in all "we had a party". Streeter Flynn tries to apply some sense into David Wood as David applies the BAC plaquard to Streeter's Mercedes. 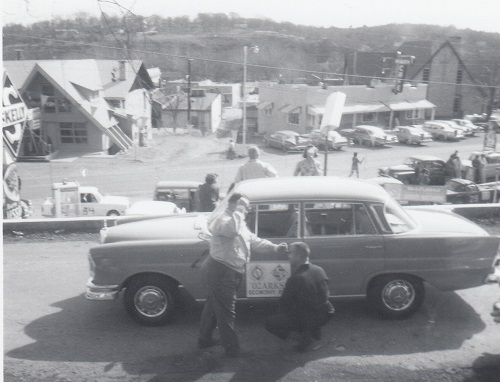 That is Main Street, Branson Missouri, circa 1963 in the background.